Wolfville, NS – The Wolfville Business Development Corporation (WBDC) is honored to announce that Wolfville has been declared, again by CBC TV, as one of the top ten cultural destinations in the Maritime Provinces. On last evening’s CBC Television production of Maritimes Cultureville, host Colleen Jones highlighted the many distinct cultural attributes of ten Maritime communities. The selection of communities was based on submissions by Maritimers and an evaluation by CBC. Wolfville, along with the Village of Canning, were in this year’s top ten culturally vibrant communities in the Maritime Provinces. CBC TV celebrated Wolfville as the home of Acadia University and Al Whittle Theatre where music and theatre are “nurtured” and as a community where “artist genius shines”. It also accentuated Wolfville’s slow food and wine experiences as offering new economic growth opportunities for Wolfville and its surrounding communities. Wolfville is a fertile culture of both the head and the hands, influenced as much by academia as the soil. It has a sense of confidence and creativity that keeps it charged with a unique brand of energy. Wolfville sets the stage now for world class experiences ranging from distinctive boutiques, world class accommodations and dining to the Wolfville Magic Winery Bus, Deep Roots Music Festival, Devour! The Food Film Fest and much more. The Wolfville Business Development Corporation is an independent corporation that represents the interests of Wolfville businesses and business people. It is funded directly by Wolfville businesses and works in partnership with the Town of Wolfville, Acadia University and business owners. WBDC promotes Wolfville through marketing initiatives aimed to create a positive profile for the Town and increasing business activity. It’s amazing the amount of conversation that can happen when you are out for a walk in Wolfville. On our walk on the waterfront, we ran into the Jim and Beth Wilson, the owners of Castaway Foundry. Check out this late night smartphone interview. Innovative Video footage from the middle of the Wolfville Harbour/Channel during the highest tides in the World. 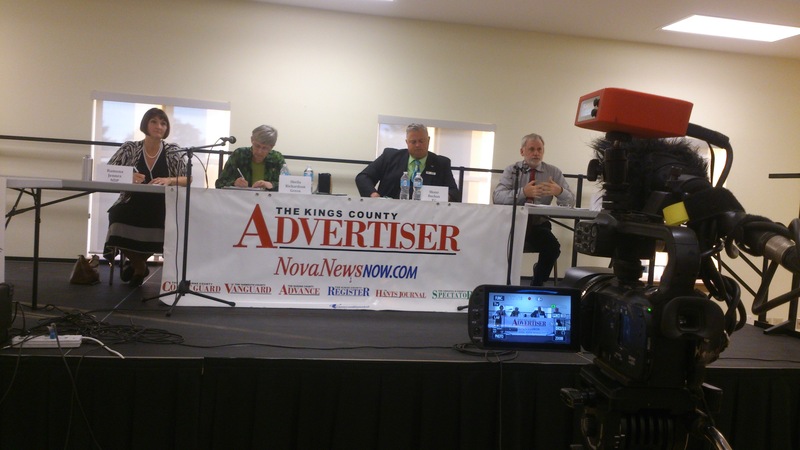 In case you could not make it to the Kings South Debate held in New Minas, Nova Scotia on September 19, 2013, below is the link to the entire debate. Below the picture are videos of each of the candidates during the final summary period of the debate. Wolfville, NS – Determined to show its pride, Wolfville will wave Acadia University colours by Painting the Town Red and Blue this coming Sunday, September 15, 2013 and will fill the Town Centre parking lot with Streetfest. Paint the Town Red and Blue will transform Town Centre parking lot, in Wolfville’s downtown core, from 2:00pm to 5:00pm into a Streetfest; a celebration welcoming new and returning Acadia University students plus give local residents the opportunity to meet their new neighbours. Streetfest will include musical performances on stage, fun activities for children and families, local business displays with product sampling, a Dunk Tank supporting Shinerama, Wolfville Volunteer Fire Department truck demonstration and much more. The Spirit Rally and Fireworks Show have been postponed for later this fall and will not occur on the evening of Sunday, September 15th. Once confirmed, event details will be released. Streetfest is open to the public and all area residents and families are welcome; admission is free. Painting the Town Red and Blue is a cooperative effort by the Wolfville Business Development Corporation, Acadia University, Acadia Students’ Union and the Town of Wolfville. The Discovery of the Lost Montague Officially Begins. 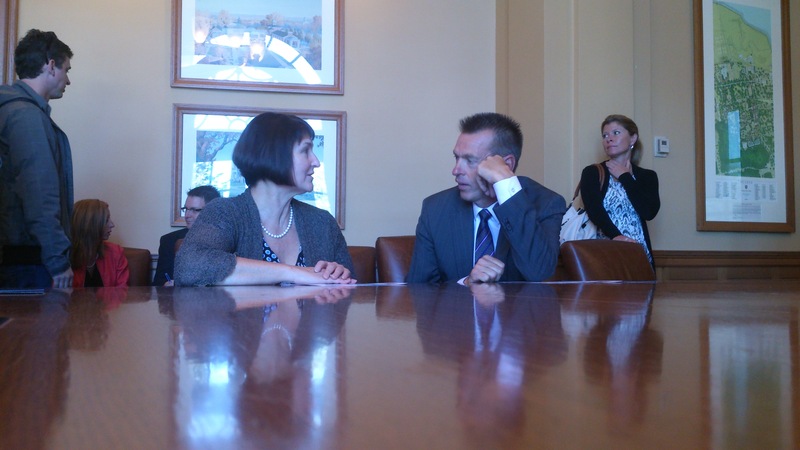 An Innovative Journey with the Kings Historical Society. Innovative has teamed alongside the Kings Historical Society on an exciting hunt for the Montague ship, a brigantine that was commissioned for carrying provisions and settlers for the townships of Minas and Canard in the 1700’s. The ship was caught in what was once navigable waters of the Canard River, at low tide in 1760. Naturally it was then abandoned and slowly disappeared under the notorious waters. The vessel’s sad fate was sealed when the mast was picked away by unauthorized scavengers. Some believe the Montague may be salvageable while others believe all is lost. The last known location of the brigantine is believed to be in the Canard River, near Porters Point. Here’s a link to a recent article written by local historian, Ed Coleman regarding the Montague. Ed Refers to a column he wrote back in May and gives a detailed description of the shipwreck’s history. Nova Scotia start-ups have a chance to compete for up to $225,000 through Innovacorp’s provincial I-3 Technology Start-Up Competition. 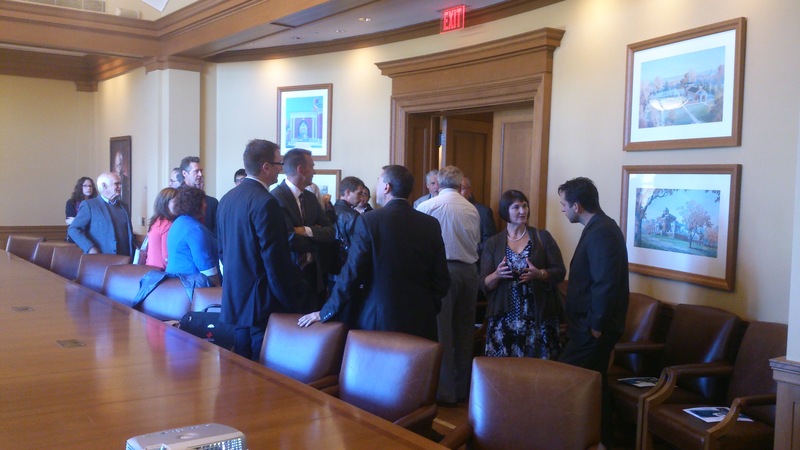 The I-3 competition was announced for the region at Acadia University, Wolfville, Nova Scotia on September 9, 2013. The program finds and supports high potential, early stage knowledge-based companies, and encourages entrepreneurial activity across the province. The competition will take place in five geographic zones across the province. Each zone winner is awarded $100,000 in cash and in-kind business building services with the second place zone winners taking home $40,000 in cash and services. The Annapolis Valley Regional Library was thrilled to present its first StoryMob Green Eggs and Ham in Wolfville. StoryMobs are where great kids’ books meet flash mobs with a dash of Mardi Gras thrown in. A story mob is inspired by an exceptional children’s book and allows for participation in a variety of ways including costumes and props, simple choreography, musical instruments and reading from the book. StoryMobs are primarily aimed at families, but warmly welcome the involvement of book-lovers, flash mob-enthusiasts and fun folks of all ages. StoryMobs is a free event. Like other flash mobs, StoryMobs appear out of nowhere in an apparently spontaneous way, in a busy public space, at a (quietly) designated time and then disperse without any additional fanfare after they have finished. The idea grew out of Toronto and is gaining momentum across the country! This story mob is sponsored by the Annapolis Valley Regional Library, Valley Family Fun and CentreStage Theatre. 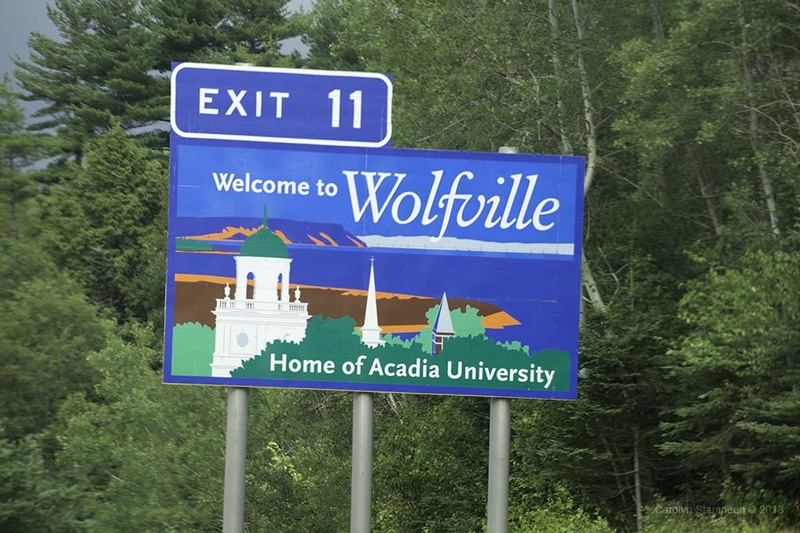 Wolfville, NS – For the second year, Wolfville will wave its Acadia University pride by Painting the Town Red and Blue, Sunday, September 8, 2013 with a Streetfest and Spirit Rally and Fireworks Show. “Paint the Town Red and Blue is chance for our Acadia and Wolfville communities to connect in a fun and festive atmosphere. Acadia University students are vital part of our town’s economic prosperity and it is our pleasure to welcome students back for another academic year,” said Suzanne Balcom, President, Wolfville Business Development Corporation. For the second part of the celebration, Raymond Field will open its doors at 8:00pm inviting in Acadia students and the entire Wolfville and surrounding communities for an Acadia Spirit Rally and Fireworks Show. Welcoming greetings will be delivered by community representatives followed by cheers from Acadia residences and a traditional rendition of “Stand Up and Cheer”. As the energy on Raymond Field builds, the Acadia Welcome Week with end with sound and colour in the sky. Fireworks FX of Grand Pre has produced a professional low-level fireworks show symbolic of Acadia and Wolfville. It will be a show not to be missed and people are encouraged to wear their Acadia red and blue! “Painting the Town Red and Blue will cap off a great Welcome Week at Acadia. Acadia students are invested in the culture of Wolfville, its people, and its businesses. 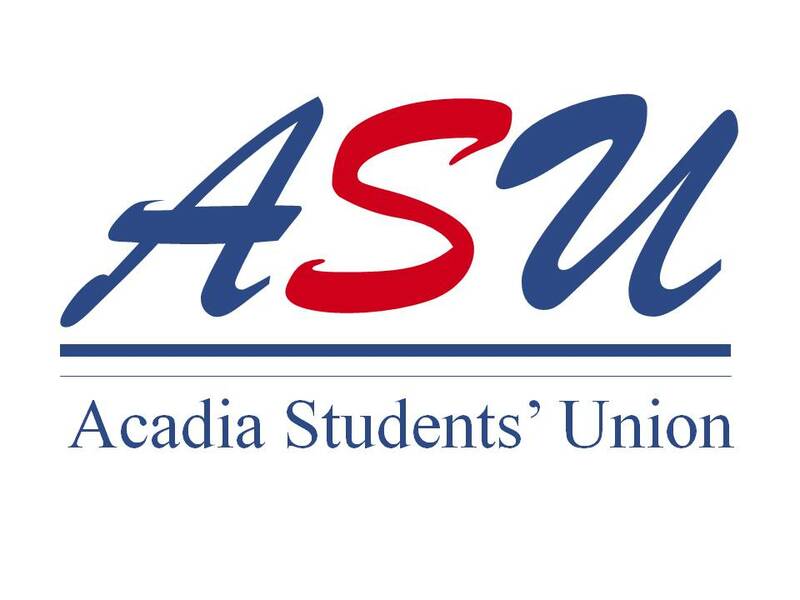 By working together and fostering partnerships like this, we will enhance the student experience and make our community an even better place to live, work, and study,” said Bryce Tully, Welcome Week Coordinator, Acadia University. For the Spirit Rally and Fireworks Show, spectators are encouraged to walk to Raymond Field or park in the Acadia Athletic Complex parking lot. There will be no parking available at the lot west of the Wolfville Farmers’ Market and the roadway heading west from Elm Avenue will be closed. Both events are open to the public and admission is free. In the event of inclement weather, a decision on the cancelling Streetfest will be made by 12:noon Sunday, September 8, 2013. Painting the Town Red and Blue is a cooperative effort by the Wolfville Business Development Corporation, Acadia University, Acadia Students’ Union and the Town of Wolfville.